Chatting with a Facebook friend reminded me that today is All Saints Day on the traditional Christian calendar. This reminded me of a hymn I loved in my college years that haven't heard for a while, For All The Saints. I just spent the last 9 days in England. One morning I took a walk and saw something that compelled me to go back to the house and get the camera. 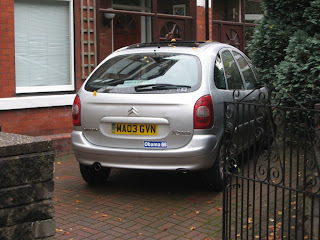 A car in Stockport, England with an Obama sticker. (Click picture for larger view). If the annual award show for commercials has a category for best unintended use of irony this one would be a clear winner. The little boy comes in to his mom and dad's room worrying about the family's financial future. "Dad, does your retirement plan provide predictability of income and protection against market risks?" I bet the AIG company wishes they'd signed up with a plan that provided those things. But wait, the commercial is for AIG! We can see how well the coverage must work, AIG isn't worried at all about market risks right now, is it? A British victory was almost inevitable. George Washington was defending a city built on islands (Long Island, Manhattan Island, Staten Island) and his attacker had command of the waterways between the islands. The British had learned at Bunker Hill not to underestimate the American ability to withstand a frontal assault, and had won a maneuver victory by attacking the American flank after a night march. But perhaps the British had learned too much caution at Bunker Hill, or perhaps General William Howe was too sympathetic to the Americans, and thought wiping out Washington's army would make a settlement with the rebels impossible. For whatever the reason, the British had an opportunity this day to largely destroy the American army and they let them escape. Winston Churchill once wrote about an admiral (Admiral Beatty in WWI) that he was the only person who could have lost the war in an afternoon. Was William Howe the general who could have won the American Revolution for King George in an afternoon, and let it go? When I wrote my post yesterday about the great divide, the example in the forefront of my mind of a writer who still sees the abundance of good in spite of the abundance of evil was Aleksandr Solzhenitsyn. This man grew up never knowing his father (his father had died before his birth), as a young man believed Soviet propaganda about the USSR building a new society, until a critical comment about Stalin in a letter to a friend thrust him into the reality of the Gulag. And after surviving the Gulag, he survived a brush with stomach cancer. The surprising thing is despite the depressing circumstances of Soviet prisons and/or cancer he discusses in his books, his writings are filled with optimism. Not foolish optimism, he knows happiness isn't just around the corner. But he believes that being good is still possible, that we can each choose to be truly human, a "tiny fragment of [our] own people", or a reflection in this life of eternity. The news today is he passed away at the age of 89, from either a stroke or heart failure. He goes on to quote Hebrews 11:33-38, about the anonymous heroes of faith who were d and refused to be released, who were stoned, sawed in two, put to by the sword. But how much faith does it take to be d and refuse to be released, to be stoned to , to be jeered, to be sawn in two. Sawn in two! Now that is real faith - truly the world wasn’t worthy of people who were willing to go through that for the sake of their God. 39 These were all commended for their faith, yet none of them received what had been promised. 40 God had planned something better for us so that only together with us would they be made perfect. But He does uphold them and honor them in the next life. But in this life they appeared to be failures. Along with what Eddie says about not imagining having enough faith to be d, I doubt I'd have enough faith to be willing to appear as a failure. The (overly) simplistic version of the Gospel of Jesus Christ says: Come to Jesus and your troubles will be over. Or the troubles you experience will be only dramatic and impressive ones that never really bother you because you'll be delivered quickly from the difficulty. I don't believe it. At least I say I don't believe it. An exhaustive transcript of my prayer life probably would reveal times when I wanted to believe it. I don't know if this is original with me, but if it isn't I can't remember where I read or heard it. Is the Gospel simple? It can be. So simple a child can understand it. But simplistic? Not really. I can whistle the first few notes of Beethoven's 5th symphony. (I can even type them -- da da da DAA). If you listen to the symphony you hear these notes repeated often, but there is a whole lot more going on. So the Gospel of Jesus Christ is like a symphonic theme, so simple a child can understand and repeat it, but capable of an immense amount of variation and exposition. A large percentage of the uncountable sum of God's thoughts have to do with it. Christians in Iraq have suffered a lot in recent years, as this article points out. It appears that having to pay money to not be killed is rather common. I've seen other articles that Christians in Iraq have often been targets of violence. A friend told me that she likes my new blog. She said it looks interesting because she knows I'm a deep thinker. I made the obvious retort, that I am a deep thinker-- sometimes it takes me hours to get back to the surface. [the] Bible--the most influential indictment of pharisees, courtiers, and tyrants ever printed. Kevin Phillips The Cousin's Wars 1999. Basic Books p 48. The book is about the ideological and cultural continuities between the English Civil War, the American Revolution and the US Civil War. The immediate context of the quote is how the high literacy rate in largely Puritan eastern England was a major contributor to the struggle by Parliament against Charles I. It dawned on me this morning that few people (even introverts like myself) really like loneliness. We don't like being the only one of our kind, the only one who has ever thought X or Y or Z or whatever our idiosyncracies are. We dislike it so much we are tempted to hide what we think or feel when it is very different from what others think or feel. But if God loves diversity, and has never created two people identically the same, doesn't it follow that we are each going to feel alone in some way? Now and then I've wondered if becoming independent from the British Empire was really the right thing to do. I've thought if I'd lived at the time, I would have supported petitioning the British Parliament to broaden representation to the colonies, but I might have hesitated at armed rebellion. Scripture does say: "Woe to him who builds a city with bloodshed and establishes a town by crime!" (Habakkuk 2:12). Isn't this what the Revolution did, found a new nation by bloodshed? But a few years ago I read a book called "The Cousin's Wars" by Kevin Phillips. He examined the continuity of heritage and cultural background with the English Civil War, the American Revolution and the American Civil War, and states that in each case the better version of political organization won out. It dawned on me that our founding father's rallying cry "No taxation without representation" could have been repeated exactly by Parliament against Charles I. And in general, democracy has proved to be the best system for government that humanity has come up with. We just finished celebrating the Independence of the USA. I'm not sure July 4 is the correct day to celebrate the beginning of the United States of America. It should be July 2. On July 2, the Continental Congress approved a resolution to become independent. http://en.wikipedia.org/wiki/Lee_Resolution. What they approved on July 4 was the text of the Declaration of Independence. So it seems the decision to become independent was adopted July 2nd, while July 4th was approving how we were going to communicate that decision. The next letter he wrote to his wife was July 7 and he didn't have anything to say about the vote to adopt the Declaration of Independence on July 4. But now maybe you have to be a real history trivia nut to really worry if Independence Day is celebrated on the right day or not. Since God has many thoughts, and we are supposed to delight in how many there are, why then should it so often surprise us when reality turns out to be more complicated than we thought?